You are at:Home»Herbs»Cuminum cyminum Linn. Latin name : Cuminum cyminum Linn. 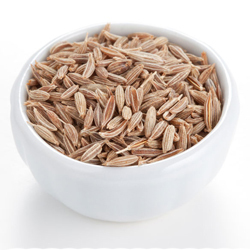 Description : Cumin seeds have long been considered analgesic, anthelmintic, antibacterial, antibilious, antioxidant, antiseptic, antispasmodic, aphrodisiac, astringent, carminative, cooling, digestive, diuretic, emmenagogue, galactagogue, stimulant and stomachic. They are useful in chronic diarrhoea and dyspepsia, for improving appetite and taste and are also useful in cold, counters heart irregularity caused by excess digestive wind, eases clamping period pain, phlegmatic cough and bronchitis. They also build up the immune system of people who suffer severe allergies. They have also been credited with aphrodisiac properties and form an ingredient of most prescriptions for gonorrhoea. Can also be used as a natural breast enhancer. They can also stimulate menstruation and lactation. Recommended Dosage : 1 to 3 g powder of ripe fruits.